One of the most versatile biscuits to me are and have always been biscotti. 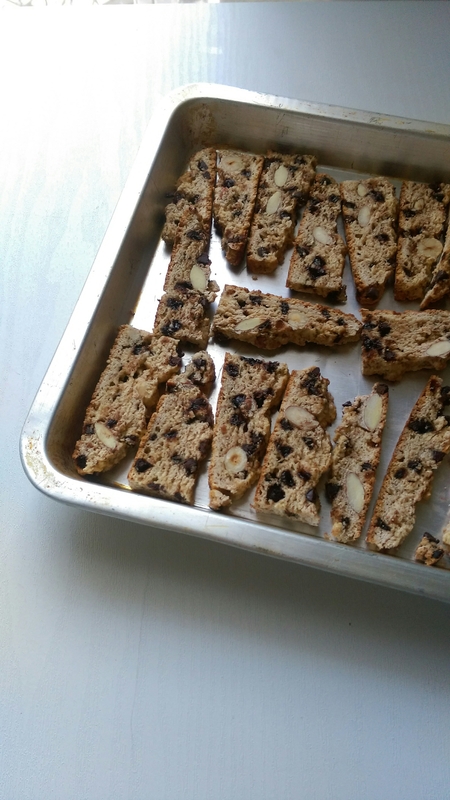 Twice baked biscotti can contain just about any of your favorite filling ingredients and what’s better it’s healthy as it does not contain even a gram of butter . So these have clearly been a family favorite since forever. Whether wheat flour or white, chocolate or fruit filling, name your favorite biscuit ingredient and add it to your biscotti mixture. It’s that simple, here is my tried and tested chocolate chip biscotti, my favorite coffee time treat. 1. In a large mixing bowl, mix together eggs and vanilla essence and keep aside. 2. In another mixing bowl, combine dry ingredients such as the flour, sugar, baking powder, salt and chocolate chips. 3. Combine mixtures of both bowls and knead to a smooth dough. 4. Preheat oven to 180℃. Line two baking trays and keep aside. 5. On a lightly floured surface, spread the dough and flatten to about 1/2 inch thickness. Transfer the dough onto baking trays and bake until edges have turned slightly brown, which should take approximately 20-25 minutes..
6. Using a sharp knife, while still warm slice into biscotti slices and place back into the oven for a second round of baking. Bake until the biscotti slices are crisp. 7. Remove from oven and cool before storing in air tight containers. Biscottis can stay for a long time if stored well. Looks enticing. Thanks for sharing! Thank you so much for putting this up, I’ll try your recipe for sure! They look mouthwatering and the recipe sounds awesome!